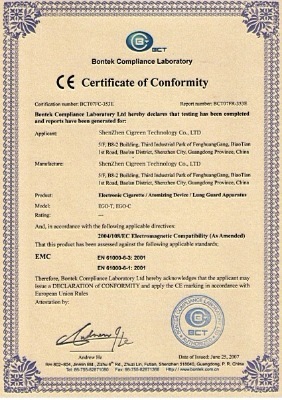 Company Overview - Shenzhen Cigreen Technology Co., Ltd.
7YRSShenzhen Cigreen Technology Co., Ltd.
We are a professional and leading company specialized in electronic cigarette manufacturing industry. Our company is located in Shenzhen, China.We offer a full range of electronic smoking devices to thousands of smokers in over 35 countries.We design, manufacture and distribute electronic cigarettes and accessories. Through the large variety of products that we develop, we have become an integral part of people who enjoy their smoke-free lives.Many enterprises claim to have the best and the most innovative products, but we deliver!Through the collaboration with global distributors and OEM partners, sharing resources and our award-winning technology, we continue to bring new products and solutions.We would like to share our knowledge, technology and experience and are always happy to cooperate with local partners, OEM customers and distributors around the globe.